As I had written earlier, you need not rob a bank to drive a Mercedes. Mercedes Benz has recently launched GLA Class and Self drive car rental company Zoomcar was quick to add few of them to their fleet. Few months after their induction, I tried my hand on this beast, most expensive car in Zoom's self drive fleet, last Sunday. Because of its high rental (Rs 6600 per day on weekend) I drove it only for 4 hours- minimum booking duration, some 30 kms, spending Rs 1100. Because of this short duration and because of 125 kmph speed limit enforced by Zoom, I couldn't explore the car to its full potential. But from whatever I could experience, I have made an attempt to share my experience and observation here, about the new Mercedes Benz GLA Class 200 CDI Diesel. Last Sunday morning, I collected the GLA class from UB city and headed to nearby Cubbon Park to get a closer feel of the car. Silver coloured grill and a silver coating on front air scoop gives a bit distinct characteristic to GLA Class. But somehow this car doesn't appear menacing to me. It is neither big and macho, nor small and sleek. A compromised mid size car. One of my objectives was to find out how GLA Class is different from A Class. GLA class is also a 5 seater hatch and appears similar in shape and size to A Class. In simple terms GLA can probably be called Cross version of A Class. GLA gets better ground clearance, slightly more power and a tad bigger dimensions. Below is a photo of GLA Class followed by a photo of A Class in similar angle, to help you compare. GLA Class is 125 mm longer, some 60mm taller and 25mm wider than A class. Proportionately GLA gets a bigger boot, little more powerful engine and is obviously expensive by about 5-8 lakhs. Most of these differences are hard to notice and somehow A class and GLA class do not appear very pleasing and commanding in design. 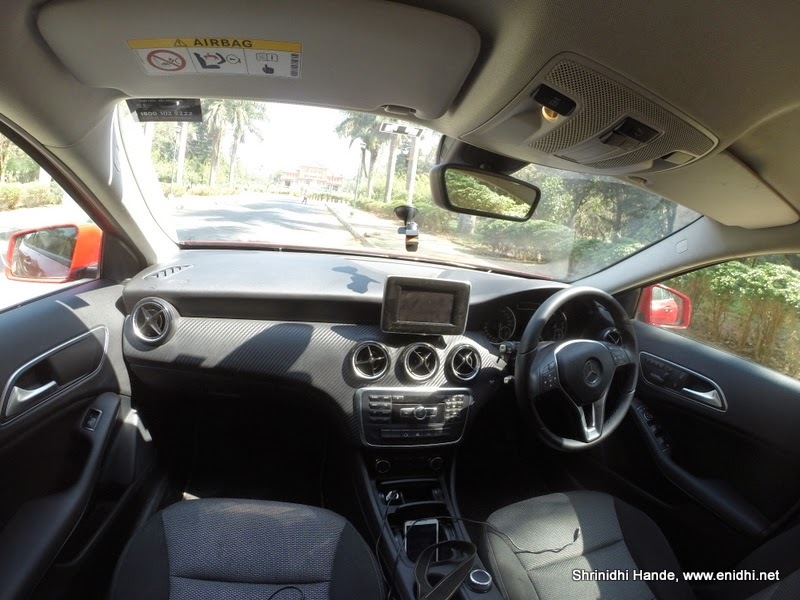 On the inside, GLA class had a white interior compared to all black interior of A Class. Still I find interior lighting inadequate. Most of the interior set up is exactly same as A Class. It is hard to find any difference. Driver seat is adjustable in multiple directions. Electric adjustment is very slow compared to manual one. When kept at its highest position (I get best view of the road in this position), my head was touching the roof almost with little or no space to move my hands freely. There are 3 memory settings for driver's seat, while passenger's seat gets pure manual controls. Again, a proper SUV is better if you're looking for space and comfort. Again, no sunroof in the cheapest variant that Zoomcar has bought. The display unit totally feels out of sync with rest of the console. Time was wrong. Some controls- like setting the trip meter, time etc weren't very obvious. Second row space is just about adequate. Leg room is decent but head room is not. Seats feel very ordinary, not super luxurious for the price tag. Tall people will find it difficult to manage in the backseat. Reverse parking sensor with projected path is very good. White line indicates straight path while yellow line indicates projected path with current steering position. A spare wheel is added extra by Zoomcar. By default car comes with run flat tyres which can be driven for about a 100 km even if they go flat. But customers are more comfortable with changing the flat tyre than driving with one, given India's road conditions, this extra tyre makes sense. Zoom Mercedes Benz GLA Class infront of Vidhana Soudha- Karnataka's power house. GLA Diesel has the same 2.2 litre power plant as in A class, but tuned for a bit higher power. It was always defaulting to ECO mode. Even if I select Sports Mode, it was defaulting to Eco next time ignition is turned on. Not sure if this is a Zoomcar enforced feature or all Benz models behave like this. If it is later, it is not good. There should be an option like "If I could pay 40 lakh for this car do you think I care about Eco- keep it in the damn sport mode all the time". I don't find GLA Class as peppy as BMW 3 series. The diesel GLA is just about 134 PS and top speed of 205kmph (Zoom limit 125 kmph) and not really as fun and as exiting to drive as some of the other cars in price bracket. Petrol engine is peppier by about 50PS and is more fun to drive. There is an AMG version but that is twice as expensive, so let us not talk about it. GLA Class competes with BMW X1 and Audi Q3. The other two are cheaper by a few lakhs (base variants) and have more power. But only Merc has paddle shift. (Paddle shift useless if you're sitting in the back. If you're enjoy driving, it gives you slightly better control over the engine and lets you extract more power exactly when you want it, not when car thinks fit). 18 inch wheels and higher ground clearance is better than A Class but Merc GLA Class by no means qualifies as an SUV. If I had 40 lakhs to spare, I would probably buy a Mitsubishi Pajero sports (Now Pajero also comes with Paddleshift) for 30+ lakhs and spend a few more to modify it, than spending it on 'Jack of all, master of none' GLA Class, or probably extend my budget and buy a Freelander 2 (Soon to be replaced by Discovery Sport) which is a proper SUV with more space, 4WD and luxury. This GLA Class I drove commands an annual insurance premium of 2.55 lakhs- that is more than 21k per month. I guess premium is little higher due to commercial nature of its registration. For white board registration insurance could be little less, closer to 2 lakhs. Still a substantial cash outgo every year. Defaulting to Eco every time ignition is turned on is a Merc's attempt to be environmentally friendly! If you had to rent one again, would you go for the A class or the GLA? As in is the GLA worth the premium over the A? If for just one or two people, A class is fine. If there're 4-5 people or for long drive/bad roads, GLA could be worth the premium (Expensive by about 1-1.5k per day). Thanks you for your opinion. True, a bigger car is more comfy on longer drives. You have mentioned "This GLA Class I drove commands an annual insurance premium of 2.55 lakhs- that is more than 10k per day" i am wondering it should work out to Rs.698 per day not Rs.10k.